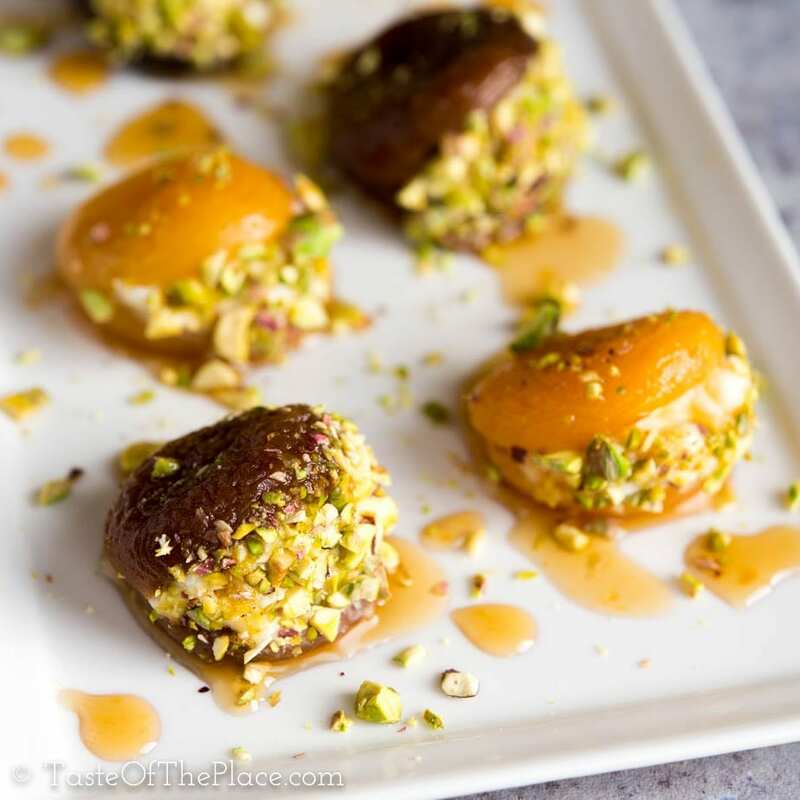 Beautiful dried Turkish apricots are soaked, candied with lemon scented syrup, stuffed with rich cream, and garnished with crunchy pistachios to make the perfect, lightly sweet one bite treat! Serve them after dinner, as an appetizer, for afternoon tea, or even for breakfast. 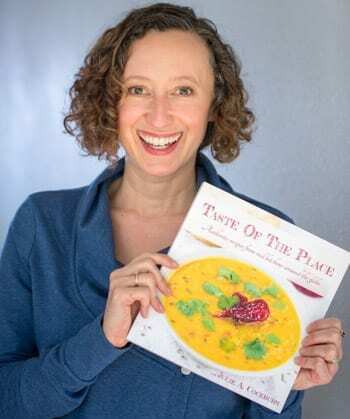 Oh, my dessert-loving friends – have I got a tasty one for you! This recipe originates in Turkey and features the world-renowned Turkish apricot. 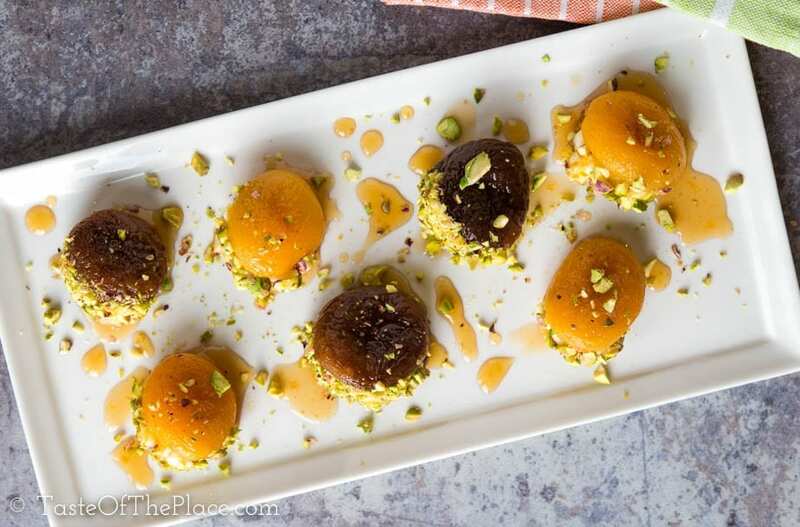 Dried apricots are soaked, candied with lemon scented syrup, stuffed with rich cream, and garnished with crunchy pistachios. So yummy! These one bite treats are just as perfect after dinner, as they are as an appetizer, side for afternoon tea, or even as a sweet bite for breakfast. The majority of dried apricots on the market come from either Turkey or California, with the bulk of those coming from Turkey. So chances are those dried apricots you’ve had hanging out in your pantry are indeed Turkish apricots. What sets Turkish apricots apart (other than being grown in Turkey) is the way they are dried. Generally, apricots in Turkey are dried whole, then pitted, resulting in a plumper, thicker fruit than apricots that are pitted before drying, as it typically the case in California. For a recipe like stuffed apricots, even if it didn’t happen to originate in Turkey, Turkish apricots would be the best option. Their plumper, thicker texture naturally make them the perfect choice for stuffing. My favorite is the Wild & Raw brand Sun-dried Organic Turkish Apricots. They are plump, naturally sweet, and happen to be available in a generous size bag on Amazon. Most dried fruit of any variety is treated with sulfur dioxide to preserve color and freshness. Just take a peek at the ingredient list of your favorite dried fruit (unless it happens to be a natural or organic brand), and you’ll see it right there – sulfur dioxide. I am personally a fan of avoiding odd-ball additives in my food and prefer the natural, unsulfured option. The issue is that non-sulfur dioxide treated fruit usually doesn’t look as pretty (Ah, the age-old debate! To go all natural with a few more wrinkles or cling to surface beauty with a few more chemicals). With apricots, for example, the sulfured varieties will be a lovely, bright orange, while the non-treated varieties are a rather dingy brown. I happened to have both on hand when I made this recipe, and you can see the color difference in the photos. I didn’t find any difference in flavor, but I did find that the sulfur treated apricots never got quite as tender as the unsulfured ones. I will leave the choice to you! 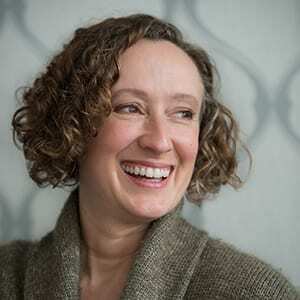 A few chemicals for added prettiness, or go the more natural route. For me, in the future, I will stick with the less chemically option, and embrace the lovely brown of a naturally dried apricot. Traditionally, this recipe calls kaymak, which is a thick cream produced in the Middle East and Central Asia. It is often made with water buffalo milk and has a consistency similar to clotted cream. While I haven’t tried it myself, it is described as decadent and creamy, with a hint of cheesy tanginess. Sounds delicious! I don’t know how it is in your neighborhood, but water buffalo products aren’t exactly readily available around here. I do, however, have a special affinity for clotted cream and happen to have a reliable method to make it. You can grab my clotted cream recipe HERE. 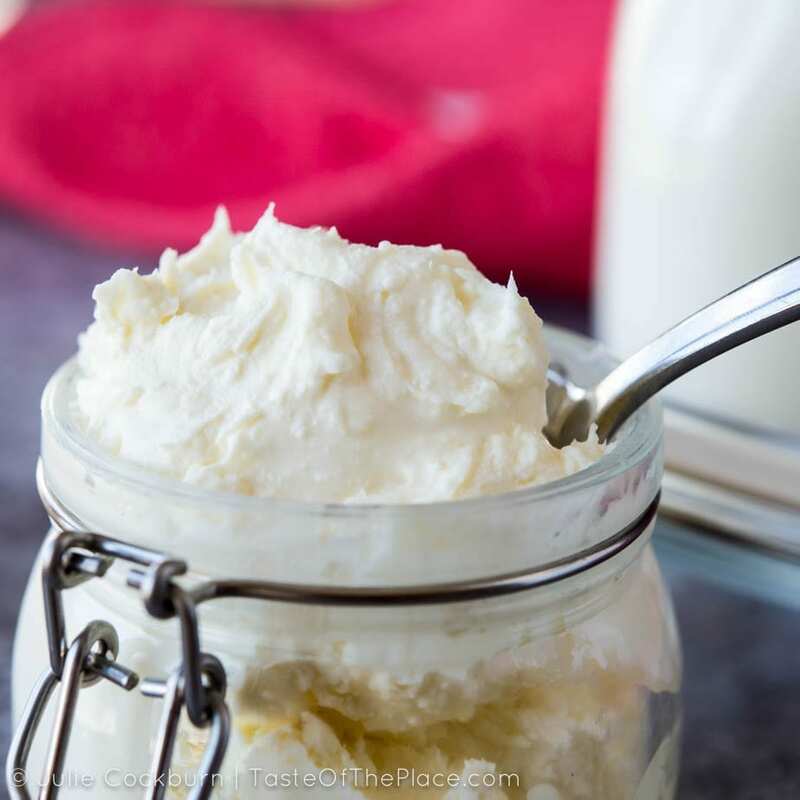 On the other hand, clotted cream takes time and presents its own ingredient-availability challenges, so a great substitute to either kaymak or clotted cream would be mascarpone. A couple other options would be cream cheese or thick Greek yogurt. When opening the apricots, use a small, sharp paring knife. Cut them about halfway open, but no further. It will be easiest to stuff the apricots if the filling is softened slightly at room temperature. I found it easiest to stuff the apricots by using a small spoon. I tried a pastry bag, but it seemed a little clunky for this task. Simply scoop up a small spoonful of filling, and load it into each apricot. I wanted to keep this recipe as true to its roots as I could but had a few ideas for how to make it even more interesting. If you want to mix things up a bit, why not try adding cardamom to the soaking liquid, or maybe stirring a bit of orange flower water or rose flower water into the cream. Both options sound divine to me! You will likely have extra syrup after you’ve put together the apricots. Don’t throw this away! Drizzle it over ice cream, spoon into yogurt, or even stir it into a bit of brandy or bourbon. Soak the apricots in 2 cups of cold water for 8 hours or overnight. After the apricots have finished soaking, remove them from their soaking liquid. You should have about 1 cup of liquid left. Add more water if needed to reach 1 cup. Combine the soaking liquid with the lemon juice and sugar in a medium saucepan, and bring to a boil. Gently add the apricots to the liquid, and reduce the heat to a simmer. Cook, stirring occasionally, until the apricots are very tender, but not mushy, 10 to 20 minutes. I found the apricots cooked unevenly, so it's best to check the apricots as you go and remove them individually to a plate when they are tender. Allow the apricots to cool to room temperature. Once all the apricots are removed from the liquid, increase the heat to a full boil, and continue to cook until the sauce is reduced slightly and starting to become syrupy. It should easily coat the back of a spoon. Remove from the heat and allow to cool. Use a paring knife to gently open each apricot about halfway. Carefully spoon the filling into each, then dip the exposed filling in the chopped pistachios. Arrange the stuffed apricots on a serving platter, drizzle with the syrup, and scatter any remaining pistachios over top. 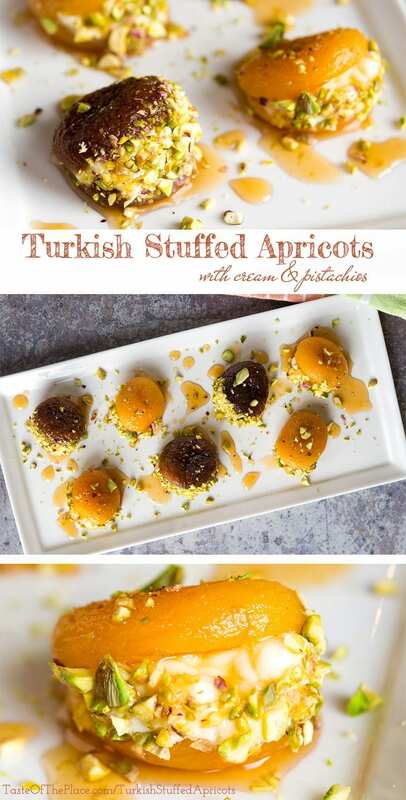 Try to use Turkish apricots for this recipe. Their plumper, thicker texture naturally make them the best choice for stuffing. This recipe traditionally calls for a type of cream called kaymak. Since kaymak is not readily available for most in the US, I've suggested clotted cream or mascarpone as good alternatives. I wanted to keep this recipe as true to its roots as I could but had a few ideas for how to make it even more interesting. If you want to mix things up a bit, why not try adding cardamom to the soaking liquid, or maybe stirring a bit of orange flower water or rose flower water into the cream. You will likely have extra syrup. Don't throw this away! Use to drizzle over ice cream or stir into a cocktail. These little gems were so delicious. I of course loved the clotted cream filling! They are especially pretty and would be so fun for afternoon tea time! I’m so glad you enjoyed! We should include them in our next tea party!